With over 1.36 billion people, China is the world’s most populous country and has the world’s largest education system. Thanks to exceptional economic growth, it has jumped from being a poverty-stricken rural society to an innovative industrial society, although there are still vast rural areas mired in poverty. Despite the rapid improvements experienced from an economic, social and educational point of view, the country still struggles with large gaps between its urban centers and rural areas where many disparities still persist affecting among others the possibility of accessing to a good quality education. 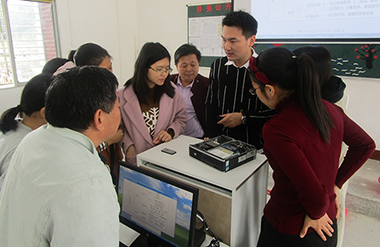 To face this problem, the ST Foundation launched its DU Program with the cooperation of the ST plant in Shenzhen, where a group of volunteers has decided to join the team in 2013 attending a first Informatics and Computers Basics Facilitation Course (ICBF) to train local volunteers. After this initiation to the mission of the Foundation the activities have grown steadily. 38 ST volunteers have helped the Foundation to boost its activities dedicating their time and energies to the implementation of the organization’s mission contributing to an increase in the number of students trained along the years. The activities in 2018 are progressing steadily and as of December 2018 over 1,700 students have been trained since the inception of the activities.